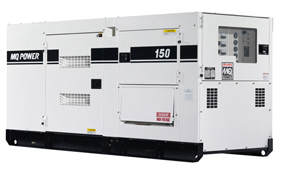 The DCA150SSIUC offers a prime rating of 120 kW (150 kVA) and a standby rating of 132 kW (165 kVA). Our patented open delta generator winding provides precise voltage control, allowing superior motor starting capability. An electronic governor maintains frequency to ± 0.25% from no load to full load. It features an auto start stop that allows the generator to start from a remote location. The unit features a powder-coated, weatherproof steel housing that allows a substantially low operating noise level of 68 dB(A). A comprehensive analog control panel provides instrumentation including AC ammeter, AC voltmeter, frequency meter, AC circuit breaker, engine gauges and much more.